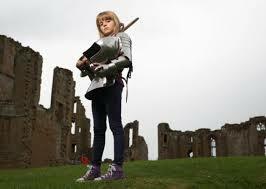 English Heritage have appointed an 8 year old boss! Thea will be the country’s youngest CEO! Thea is going to be bringing kid’s historic wishes to life! They all sound pretty amazing! Hopefully you’ll be able to have a go at some of these at an English Heritage site near you! Click here to learn more about the English Heritage! A lot of the kids who voted also said they’d like to travel back to Roman times and the age of the Vikings! I wonder if Thea can help build a time machine too? Check out Thea’s first day in the video below!